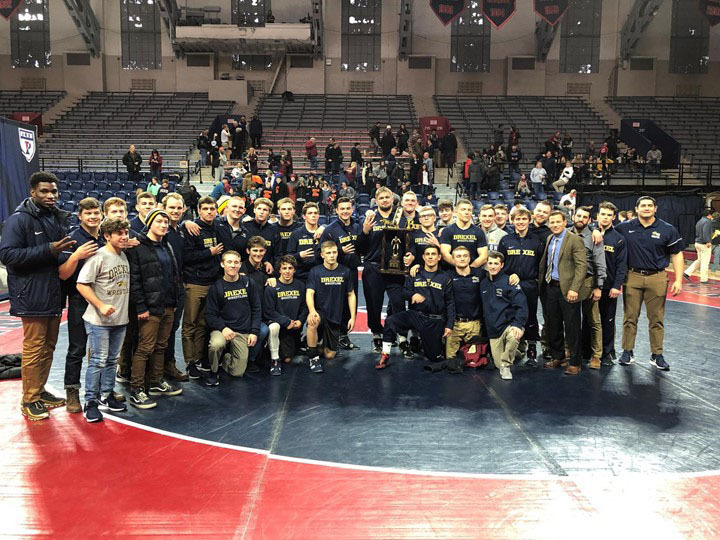 The Drexel University men’s wrestling team went on the road during the weekend to compete at two dual meets, their first of the year. Drexel faced two local rivals, one of which was a Philadelphia rival, the University of Pennsylvania, and the other being Rider University from Lawrenceville, New Jersey. The Dragons first took on Rider Jan. 11, and while they claimed victories at a number of weight classes, they could not come out with the win. Drexel would end up dropping the first three matches at the lighter weight classes to open up the meet at a 9-0 deficit. Freshman Antonio Mininno faced Rider junior Jonathan Tropea at 125 pounds in first match of the day. The bout ended 12-6 in favor of Tropea, putting the hosts on the board at 3-0 ahead of Drexel. The 133-pound matchup was headlined by sophomore Chandler Olson and Rider senior Anthony Cefolo. Olson stayed ahead on points for the first two periods before a late takedown in the third by Cefolo who stole the match from Drexel, with the 4-3 score emphasizing the close nature of the bout. Next up, at the 141-pound weight class, the effort of sophomore Julian Flores against Rider sophomore Travis Layton proved to be just as competitive as the 133-pound bout. Flores would rally late in the final period but it was not enough to overcome the deficit he suffered early on. The match would end 4-2 in favor of Rider. Drexel managed to put up some points in the 149-pound division, which saw sophomore Parker Kropman defeat Rider junior Evan Fidelibus 16-3 in dominant fashion. Kropman’s efforts, which set the overall score at 9-4, put Drexel back into the meet. Another close match-up was contested at 157 pounds, as sophomore Evan Barczak took on Rider senior Gino Fluri. After three periods, the score stood at 3-3, forcing an overtime. Fluri was the first to secure a takedown in sudden death, earning the 5-3 decision. The Dragons earned their second batch of points during redshirt freshman Bryan McLaughlin’s 174-pound match against Rider freshman George Walton. McLaughlin managed to hold on to an early lead to take a 9-6 decision and put Drexel at 15-7 overall. Drexel saw another defeat despite a close scoreline at 184 pounds, as freshman Anthony Walters fell 4-2 to Rider redshirt senior Michale Fagg-Daves. With the scoreline sitting at 18-7 in Rider’s favor, Drexel would need pins in the last two matches to walk away with a win. Hopes for a comeback win for Drexel were dashed after junior Owen Brooks gave up a promising lead to Rider sophomore Ethan Laird. After almost getting pinned in the first period, Laird came back to earn an 8-7 victory, which secured the meet for Rider. Though the meet was all but over, redshirt senior Joey Goodhart secured the lone pin of the day over Rider senior Ryan Cloud at 285 pounds. Goodhart’s win put the final score at 21-13 with Rider taking the win overall. Drexel’s second competition of the weekend came Jan. 13, when the Dragons made the short trip to 33rd Street to face Penn at the historic Palestra arena. The neighborhood rivalry had gone the way of Drexel for the past three years, and the Dragons managed to extend the streak to four after a thrilling back-and-forth contest. First on the mats for Drexel was Barczak at 157 pounds, who took Penn senior Joe Oliva to overtime but lost out in sudden death for a final tally of 7-5. Drexel would then see their next three wrestlers post critical wins to give the Dragons an overall 9-3 advantage. Junior Ebed Jarrell would tie up the score for Drexel after winning his match at 165 pounds against Penn sophomore Evan DeLuise 4-2. McLaughlin and Walters kept the momentum going by winning out in their contests at 174 pounds and 184 pounds, respectively. Drexel’s lead was cut down to three points after Brooks lost at 197 pounds to freshman Greg Bensley 6-0. Fortunately, Goodhart managed to point Drexel in a good direction following his heavyweight contest over Penn freshman Ben Goldin, who he soundly defeated 11-3. Penn managed to take over at the lower weight classes as the meet reached its endpoint. Mininno fell 8-4 at 125 pounds to Penn freshman Doug Zapf, while Olson earned the Dragons their last win of the day at 133 pounds. Drexel dropped their final two matches, as junior Nick Widmann and Kropman combined for two decision losses at 141 and 149 pounds, respectively. Despite the losses, neither of the two wrestlers suffered a pin loss, ensuring Drexel maintained the upper hand in the local derby, narrowly edging out their foe 16-15. After defending the Cheesesteak Trophy against Penn, Drexel will face one of their biggest challenges of the year Jan. 19, an away dual meet against North Carolina State University, whose wrestling program has been consistently ranked by the National Collegiate Athletic Association as one of the top ten in the nation.